Despite what Will Smith would have you believe, there's more to Miami than just nightclubs and beaches. Read on for more about the city's rich history. 1. The city of Miami gets its name from one of the native tribes that lived in the region in the 1600 and 1700s, the Mayaimi,. 2. It officially became a city in 1896 after local businesswoman Julia Tuttle encouraged one railroad mogul to expand into the area—making Miami the only major U.S. city to be founded by a woman. 3. Across the Biscayne Bay from Miami proper is Miami Beach, which was incorporated in 1915. The land on which Miami Beach was founded wasn't much more than a big sandbar; deeper water channels were dug around it and soil was added to the surrounding area in order to create livable land. 4. Because Miami Beach is largely man-made, its beaches frequently have to be replenished with new sand (a resource some experts say is running out). A diminished shoreline means residents are more vulnerable when big storms hit the region. 5. Miami Beach is home to the world's largest collection of Art Deco architecture. 6. Approximately 14.5 million people visited Miami in 2014. Based on occupancy rates, it's the fourth-best hotel market in the country after Oahu, San Francisco, and New York [PDF]. 7. The Port of Miami is known as the Cruise Capital of the World, serving almost five million passengers annually. 8. Miami has long been a vacation destination for the famous and infamous alike. In 1929, Al Capone bought a home on the area's Palm Island against the wishes of the isle's residents. The mayor at the time, J. Newton Lummus, leapt to Capone's defense once it was revealed that the residence the crime boss purchased had been his. 9. 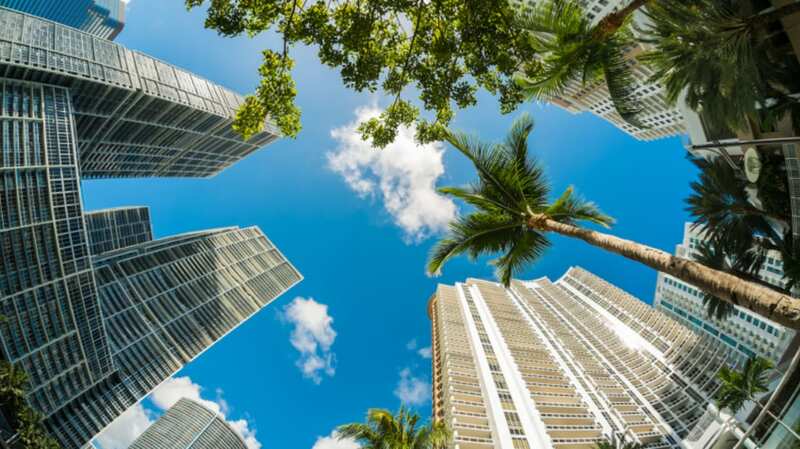 Miami has more than 800 parks in total and is the only U.S. city surrounded by two national ones: Biscayne National Park and Everglades National Park. 10. In the 1940s, Benjamin Green—a pharmacist who served as an airman in WWII—developed one of the world's first sunscreens. Back home, he perfected his formula, adding cocoa butter and coconut oil. His recipe eventually became Coppertone. 11. The first Burger King opened in Miami in 1954. Three years later, the restaurant introduced its now-iconic burger: the Whopper, which sold for a not-so-whopping 37 cents. 12. Though it's best known for its gorgeous white sand beaches, you can find one of the country's biggest (snow) skiing clubs in Miami Beach. 13. Miami is a diver's paradise: dubbed the “Wreckreational Diving Capital of the World," its waters boast 50 different underwater wreck sites for SCUBA enthusiasts to explore. 14. The city's downtown has the largest concentration of international banks of anywhere in the country. 15. In 1996, one Citibank in Miami Beach took banking-on-the-go to a whole new level when it introduced an ATM specifically geared towards roller bladers. 16. Polar vortex got you down? Better head to Miami. Its average temperature during the winter is between 60 and 75 degrees Farenheit, making it the U.S.' warmest location during the season. 18. It has snowed exactly once in Miami's official meteorological history. Flurries were recorded on January 19, 1977. The chances of a white Christmas in Miami? "Less than one percent," according to a meteorologist with the National Weather Service. 21. In 2013, Ringo Starr launched a public search for the teens he photographed during a visit to Miami. He should have expanded his investigation: it turns out the photo was actually taken in New York. "How do you mistake New York for Miami?" quipped one news anchor. "Oh—it was the '60s. Nobody remembers anything correctly." 22. One man, working all by himself—Latvian immigrant Edward Leedskalnin—built the area's iconic Coral Castle out of 1100 tons of coral rock. The project, a monument to his long lost love, Agnes, took him almost 30 years to complete. 23. The Miami International Airport provides approximately one out of four jobs in the local economy. 24. Among U.S. airports, MIA handles the most cargo and the second-highest number of international passengers. 25. Some members of the storied Country Club of Miami believe that the ghost of Honeymooners star Jackie Gleason haunts their exclusive golf facilities. Gleason was a regular at the club after he moved to Miami in the '50s, and would frequently host fellow celebrities (including Bing Crosby and Bob Hope).